Here is a simple question: where is the growth in crude oil consumption coming from? According to Barclays Capital it's driven by four nations. They are Brazil, India, China, and somewhat surprisingly (and yes, we are talking about demand growth) Saudi Arabia, the so called BICS nations. Barclays Capital: The reason for bringing together Brazil, India, China and Saudi Arabia is that once one has disaggregated global oil demand into BICS and non-BICS, it becomes clear which element is the key to predicting global oil demand. If you get BICS right, you have normally got the shape of the whole picture right. By contrast, if you get the US, EU or OECD right, you quite often can still miss the big picture. Perhaps the focus should be shifting to getting a better handle on BICS. 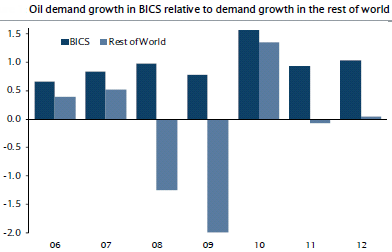 Last year BICS generated all the growth in global demand for oil. Given the economic malaise in the developed world, this year we expect the same. So the next time someone asks why people in the US and the EU pay such high gasoline prices all of a sudden, the answer is simple - BICS.